The viewpoint sits atop limestone boulders that spill gently into the tranquil turquoise sea. Here you get a fantastic view of the Chaweng area through to Mae Nam Beach in the distance. If you're an early starter this is a great spot to watch the first of the morning sun rising from the east. When visiting Lad Koh, you may wonder what all the honking of passing vehicle horns is about? Just to the right of the viewpoint is a small spirit house temple, built in memory of the souls that lost their lives traveling on the island ring road. The drivers are honking out of respect. Usually you'll find street vendors here selling refreshments, fresh fruits and ice-cream. If you are feeling a bit hungry and fancy something a bit more substantial, then you might want to try lunch at Dr. Frogs right next door. Apparently they have the best pizza on Koh Samui; for sure they have one of the best views to enjoy it from. Many island tours visit Lad Koh as there first stop before heading south to other sites such as the Mummified Monk and Tarnim Magic Garden. If you wish to visit yourself, jump on a Songthaew or pull up on your hired scooter or car. 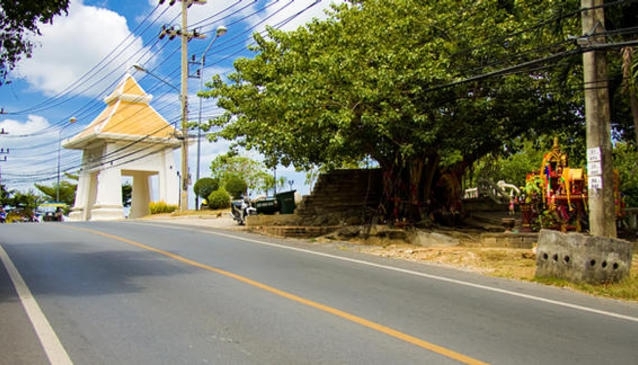 The location is on the main ring road just outside of Chaweng heading towards Lamai.